So what you will also see is hot and cold side. 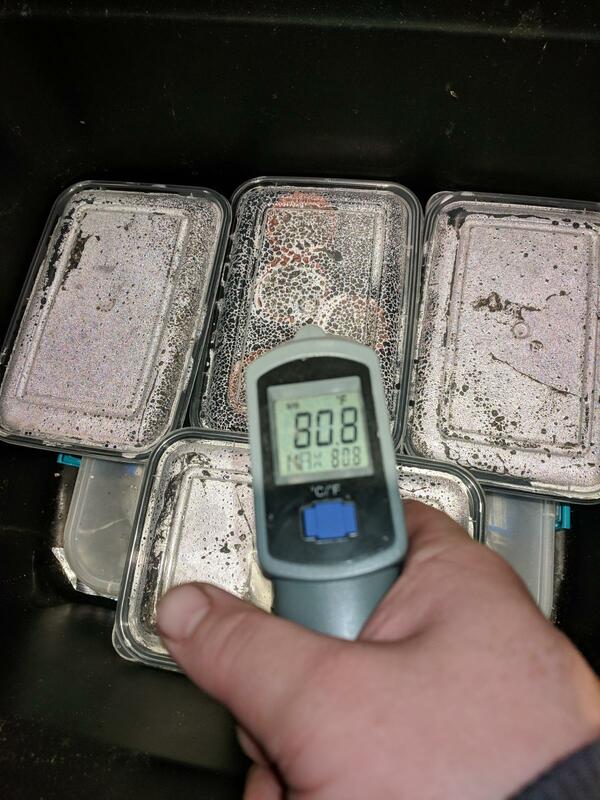 One tray sits off the full heat mat and is generally 5° cooler. The temp ranges from 99-85 when system of off. I'm thinking this is too high for this guys and again day one here. This was my heating set up for my fruiting chamber and I've taken it out for a deep cleaning removed all petlite adding the spent to my 8*8 raised bed. 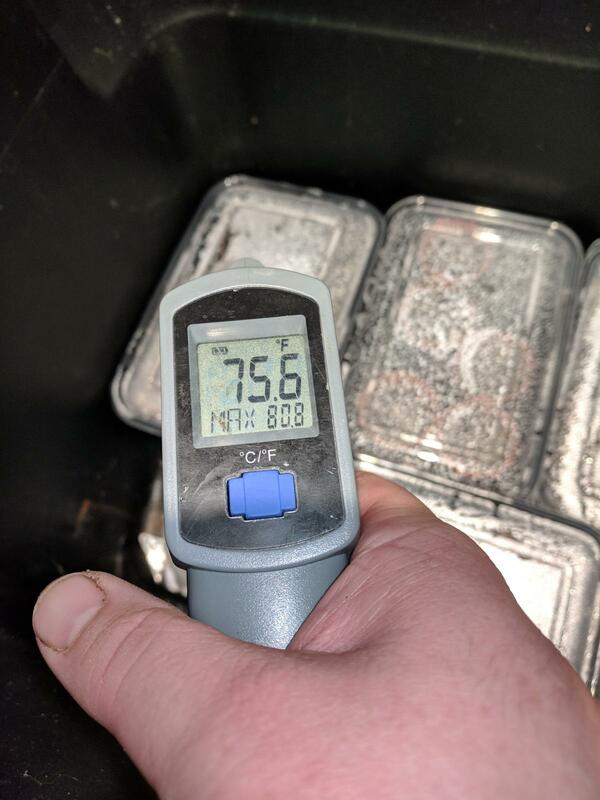 I wanted to see if this would be a good but with out my fruiting chamber the temps seems too high. 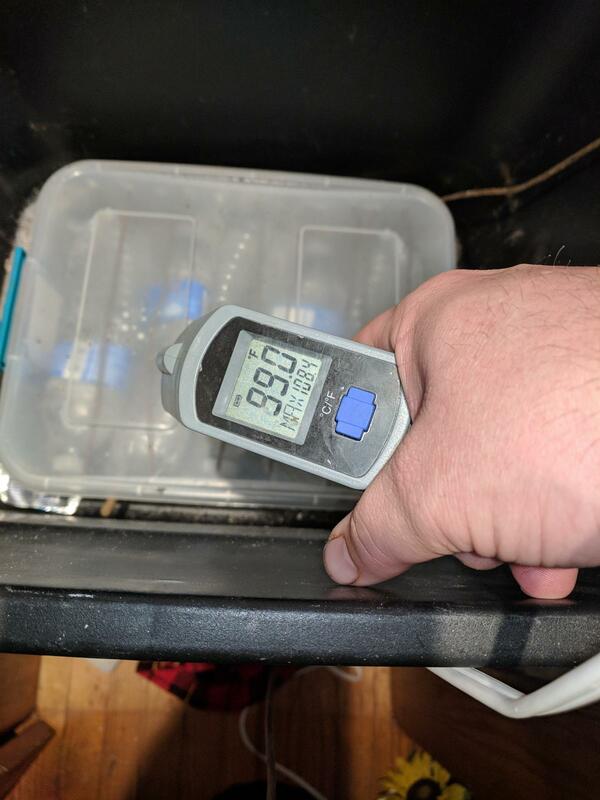 So what I think I'll do is but a shelf in my 2*4 grow tent and the light keeps the tent around 80 in day and the room drops no lower than 70 at night so would this be a better option? Please comment and advise and share your mistakes with me so I don't have to make this little ones suffer!! Thank you and more pix to come. Also they are l.w. 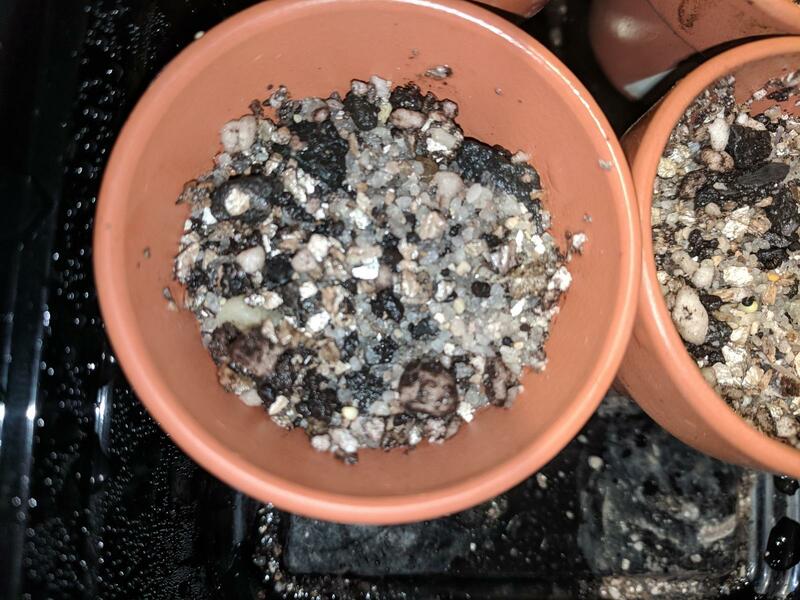 tricho macrogonus, pachanoi macrogonus, and juuls giant. Figured you should know that to. 99 is a bit hot. 88 should be your max if you can adjust for that. 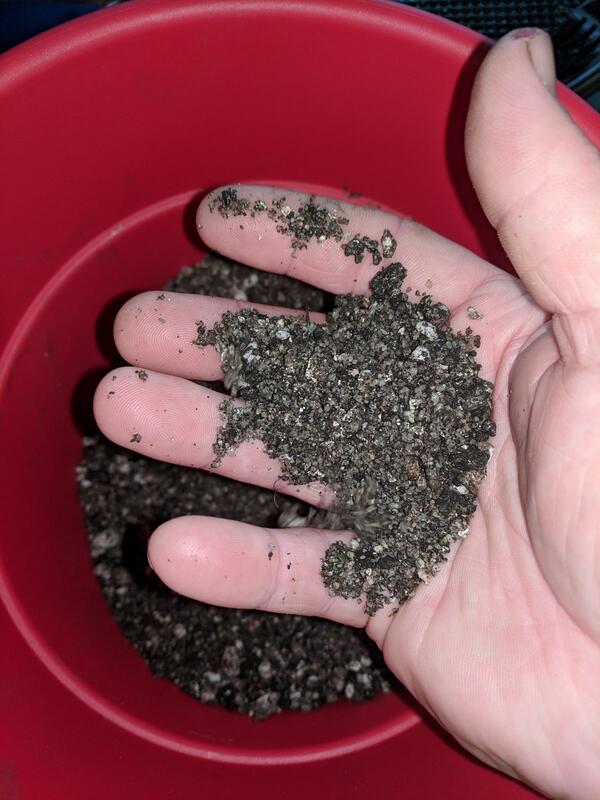 I know many that do fine with maintaining one temp, but I feel the germination goes better with some day to night fluctuation. 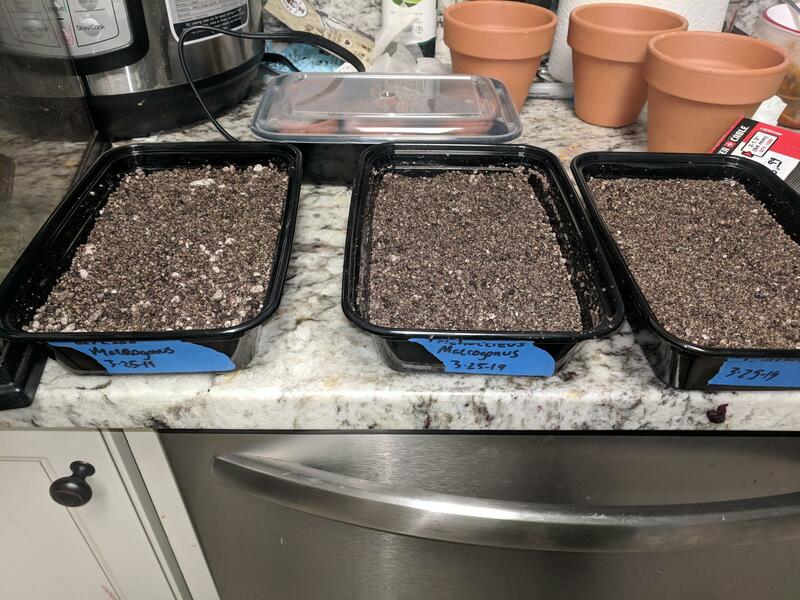 I try to keep seeds no cooler than like 75F at night. Alright guys well i got the f.c. 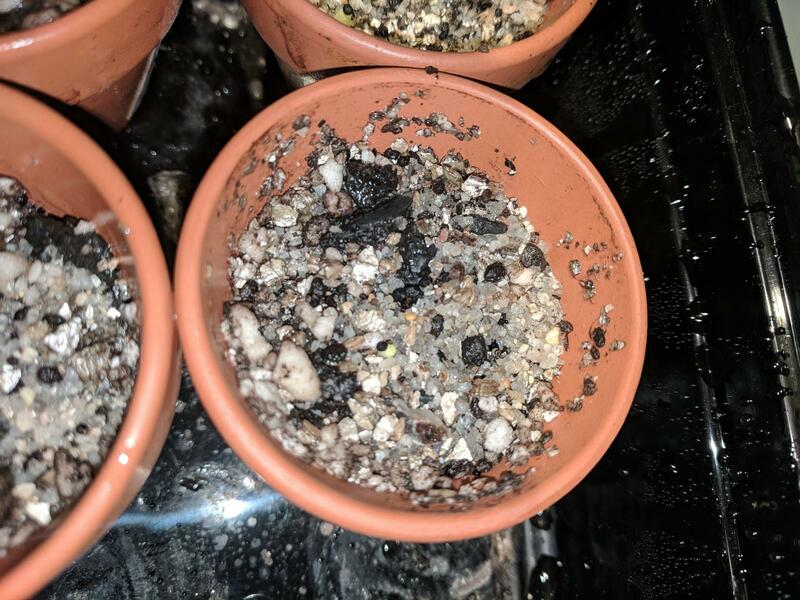 super cleaned with fresh perlite and water so now it's a cactus seedling starter for the next few months! So it's been 36 hours and the temps are reaching a normal. High of 84 low of 75. 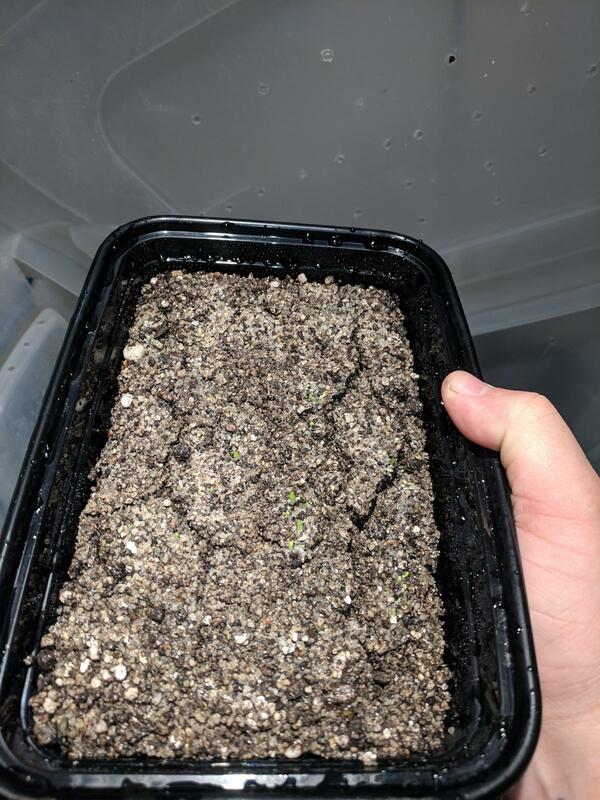 I wish there was more to share but it's gonna be 10-15 days before seedlings pop and after that it's another what 60 days before I start hardening them off? Man I don't know how I was this lucky but after 4 days I have baby l.w. 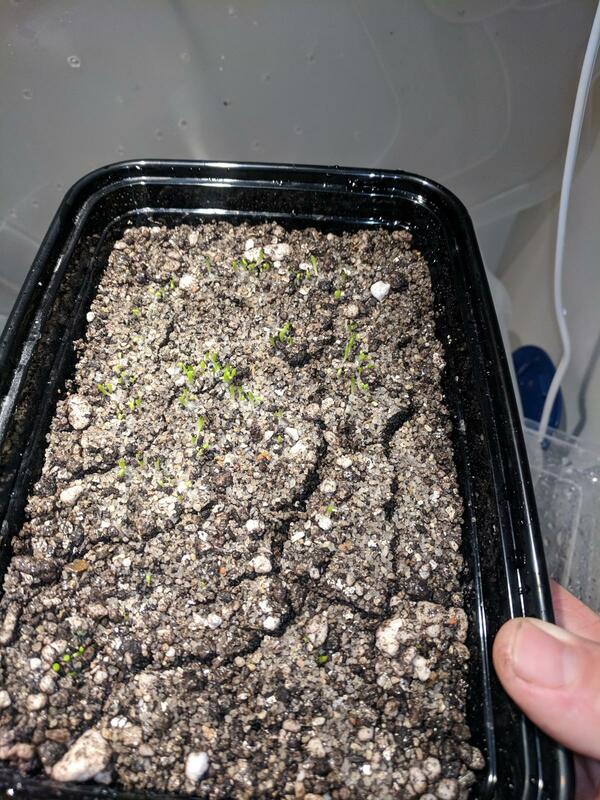 sprouts!!!!! For the next 2 weeks, you will likely see a few more pop. 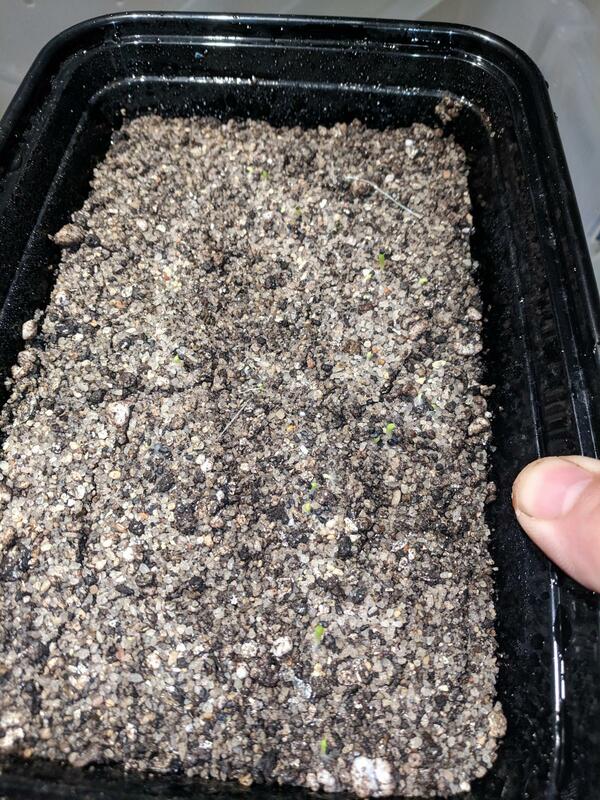 Even if that does not happen, I would be pleased with the germination amount already ! 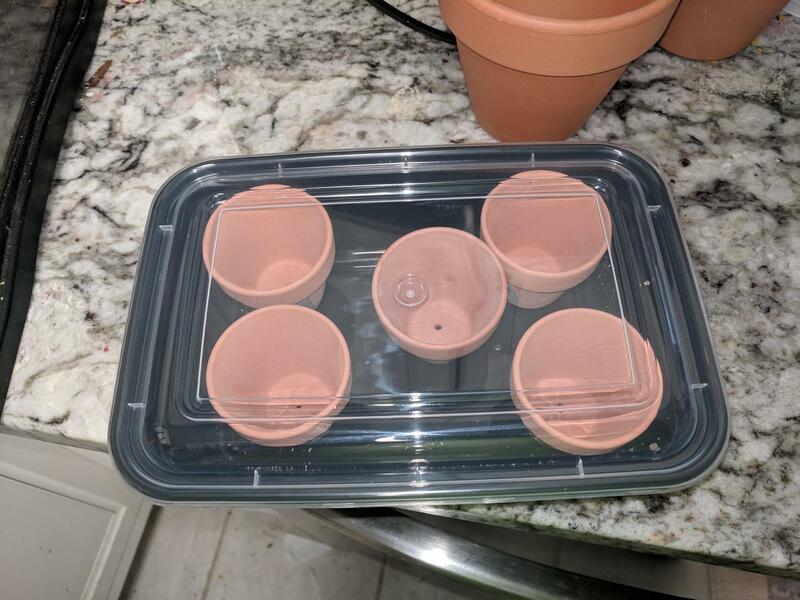 The numbers and placement of the LW in the pots, will be perfect just as they are for several years, and leave each little yote ample room to grow. 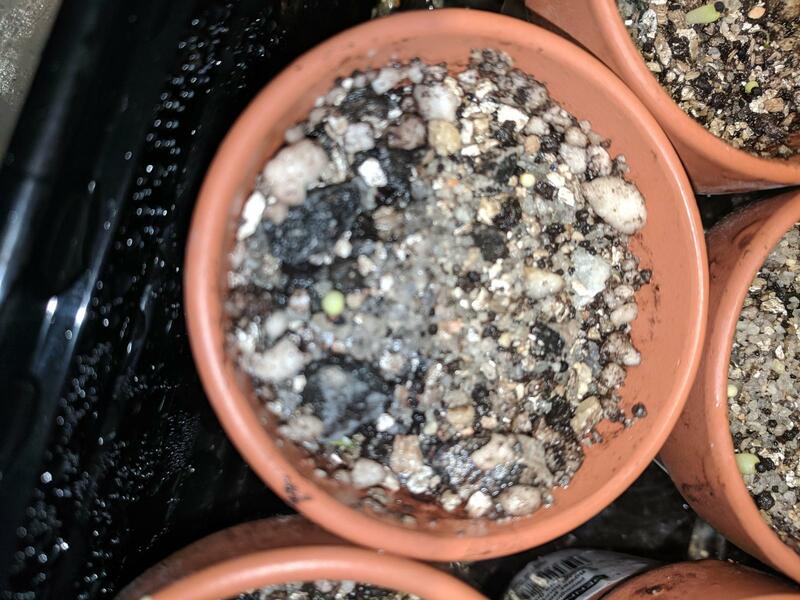 Not much to update but t.m., p.m, and juuls are all showing a split in the top, I seem to remember my dragon fruit seeds sending w fat leafs first and the cactus growing out from it. Is this correct to assume? 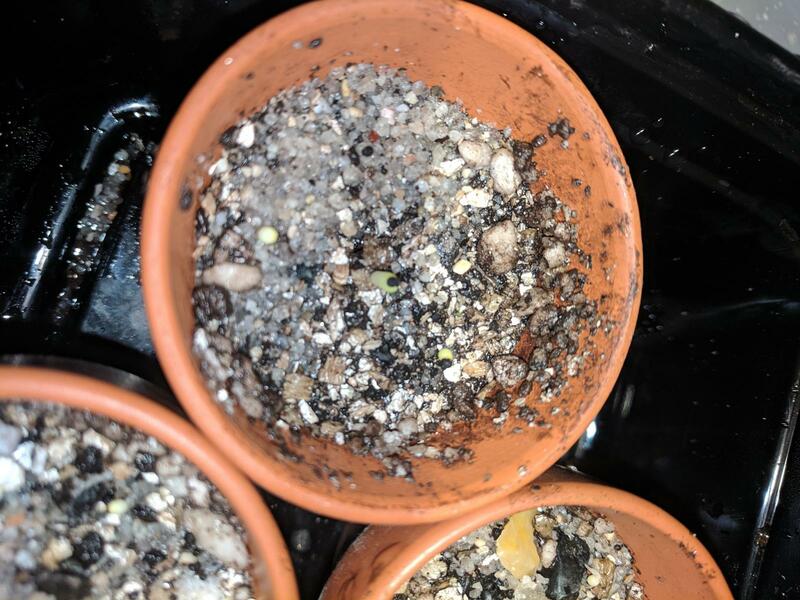 Yea they usaly have 2 small pointed "leafs"
Not as large as dragon fruit seedling tho. 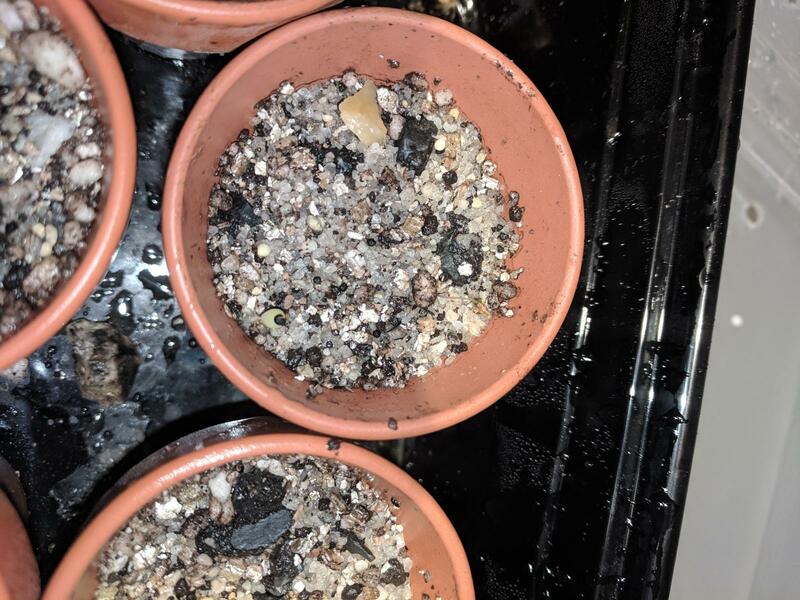 I have have some seeds come up with 3 pointed leafs. Also i agree with skywatcher, it seems to be very addictive! So again not much going on to photo but I'm seeing little white hairs on top of the l.w. non of them are doin a forked top like the t.m. p.m. and juuls. I got a new fishtank(free in the trash on my bike ride home from work) And am keeping my little ones in my seedling tent now under my LEDs and they all seem more perky. So I got glass for the lid of my tank and it now fits the tank lid. We can now keep humidity inside the glass and my babies will grow better! !